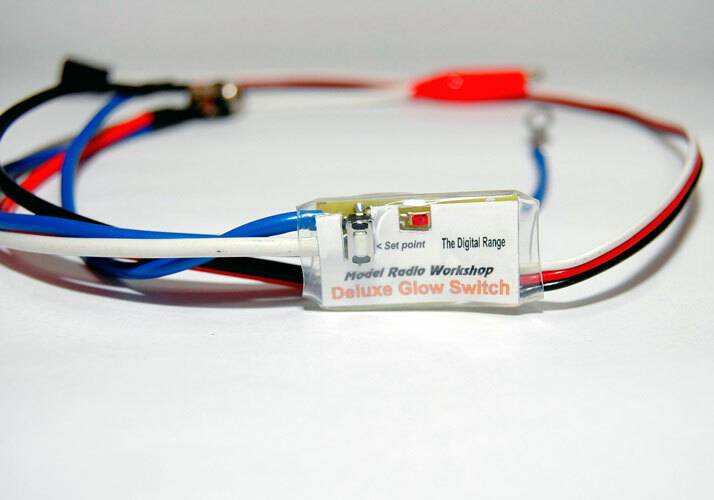 The Deluxe Glow is the same as the standard glow switch, but with all the leads, croc clip, and tag washer fitted. This makes it ready to use apart from fitting the NiCad of your choice to the Glow switch. This version of the Glow Switch also has a charge socket fitted which you mount on the fuselage for ease of charging. The glow plug is inhibited below the user selected tick-over position. The operating point (set point) can be anywhere on the stick travel. The stick direction is automatically detected. 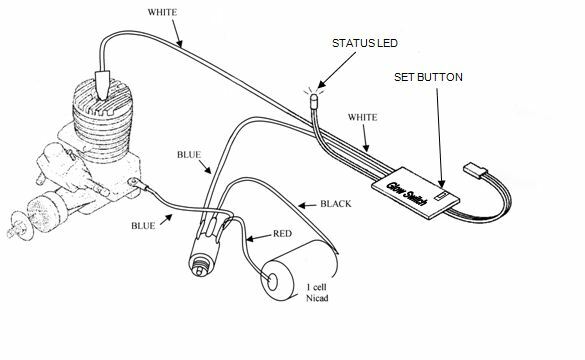 LED lights when Glow plug is active. LED lights to confirm set-up. Connect the throttle servo to the receiver using a “Y” harness and plug the Digital Glow Driver lead into the spare arm of the “Y”. Move the throttle stick and trim to the tick-over position and press and hold the set key. The LED glows to confirm that the tick-over position has been stored. If the LED is already glowing (because of a previous setting) when the key is pressed, the LED will blink out before glowing to confirm that set-up is active. Move the throttle stick to the position where you would like the Glow Plug to activate. (About one eighth throttle is a good starting point.) Release the key. The LED goes out to confirm that the set-up is complete. When the throttle stick is above the set point, the glow plug is off and LED is dark. As the throttle stick position is reduced to below the set point, the LED will glow to confirm that the Glow Plug is on. Below tick-over, the glow plug is off and the LED is dark.